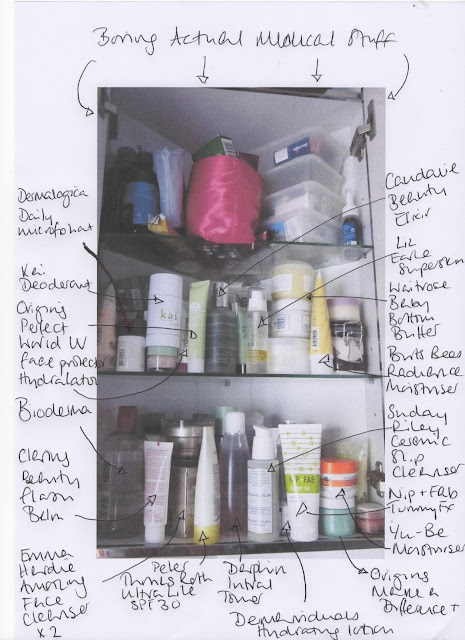 When I get sample sizes of things I usually put them in my make-up or wash bag to use when I'm away from home. That way they don't take up too much space and I get to try that one thing out for a continued period of time rather than trying out lots of different things at once. Premae's Harmony Balm was in my washbag for a recent visit to Norfolk and was the only facial moisturiser I took with me. It is not only a lovely moisturiser but a fantastic primer for make-up or perfect if you are going for bare skin reducing oil and redness and giving a really silky finish. I was surprised how in love with this I was. When my spending ban is over I shall definitely be buying a full sized version of this. I always wear black eyeliner so the other day I was brave and went for blue instead... You don't have to use as many blues as I did and it's also a great look for those of you who hate using brushes most of this can be done without. For mainly hormonal but partly heat related issues I've been a bit spotty this week and my Dermaviduals Soothing toner has been really helping it all calm down. The weather in London has been so humid and sticky that your face feels grubby by the end of the day whatever you've been doing so do properly look after it in the evening feels even more necessary than usual - I love this toner. 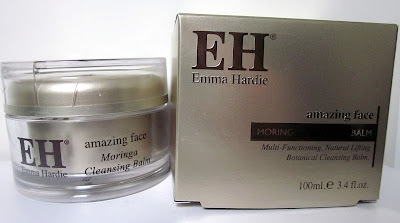 A couple of weeks ago I had the Emma Hardie Cleansing Balm as my Product of the Week and it may well have to be my product of the year (yes yes I know we're only in July... ) as I am totally in love with and very evangelical about it. I heard about the Amazing Face Cleansing Balm through the wondrous Caroline Hirons of BeautyMouth fame who recommends balm cleansers if only because they make you actually wash your face rather than naffing around with cotton pads and never actually cleaning it properly. This made sense to me and as 30 looms and the baby continues to be well behaved but exhausting nonetheless, I thought maybe it was time to kick my skincare routine up a notch. No more scrubbing away with Bioderma Crealine Micelle Solution and slapping on any old moisturiser I'd been sent. 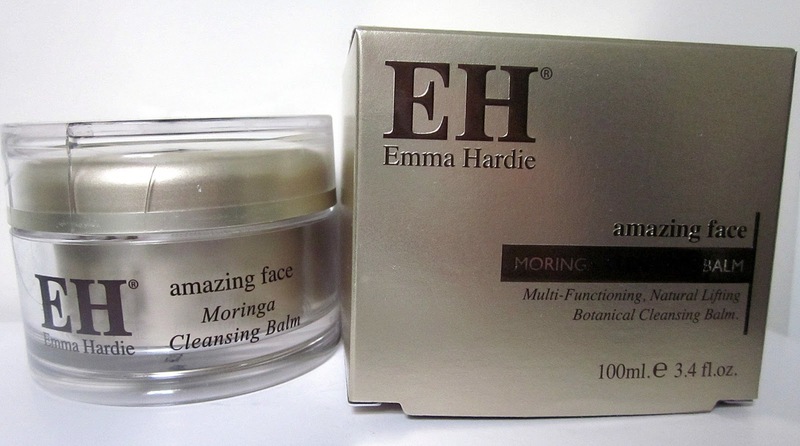 Well that still happens but there are now so many more stages in-between involving toners, face oils, serums and most gloriously of all... the Amazing Face Moringa Cleansing Balm. This cleanser is recommended for mature skin and although I don't have that yet it's also great for sensitive skin which I do have in some places and it's not at all harsh so there's really no harm in using this on younger skin. The texture is absolutely gorgeous, especially if you have dry or dehydrated skin, you can feel it moisturising, so I leave it on for as long as possible - applying it after removing most of my make-up with Bioderma Crealine Micelle Solution and washing it off last thing before I get out of the bath. If, however, you only want to cleanse once this will get your make-up off which is pretty wonderful. The trend for big, natural eyebrows may be ongoing but in case you fancy changing it up here's a video on how to block them out completely! Great for creative make-up, fancy dress and face painting. I only wore Butter London nail varnish last year as I was pregnant and it's free from any nasties. The colours are lovely but for summer One Perfect Coral by Revlon is my go-to nail varnish for my toes and it's great to have it back on. Long lasting, easy to apply and the perfect mix of orange, pink and red. Perfect for adding a bit of shimmering bronze to your cheek bones and high points now that summer is finally here. Way-to-Glow is a great quad of colours that add subtle, highlighted colour without making you dirty or orange. Add to the top of cheek bones and high points of brow for a summery shimmer. Loved it two years ago - my original review is here. Colour Extend from Redken is the one shampoo and conditioner that consistently keeps my hair looking bright, smooth and non-frizzy. I've been using it for the past 8 months - a recommendation from my colourist as reasonably priced alternative to Kerastase and I will continue to use it for the foreseeable future. With most shampoos and conditioners I've used, even the expensive ones, I find I see and feel the benefit for the first week or so and then the frizzy, fried look returns and I need to use other treatments to keep it in reasonable condition. I've also been using less and less of the L'Oreal Expert Silver shampoo - my go-to product for keeping my blonde as white as possible a month or so after having my colour done. At £12.50 for the shampoo and £13.75 for the conditioner it's hardly bank-breaking for haircare products that really work and will last you two months or so depending on how often you wash your hair. And often you can find a deal where you can buy both for about £20 - lookfantastic.com has a great deal at the moment. 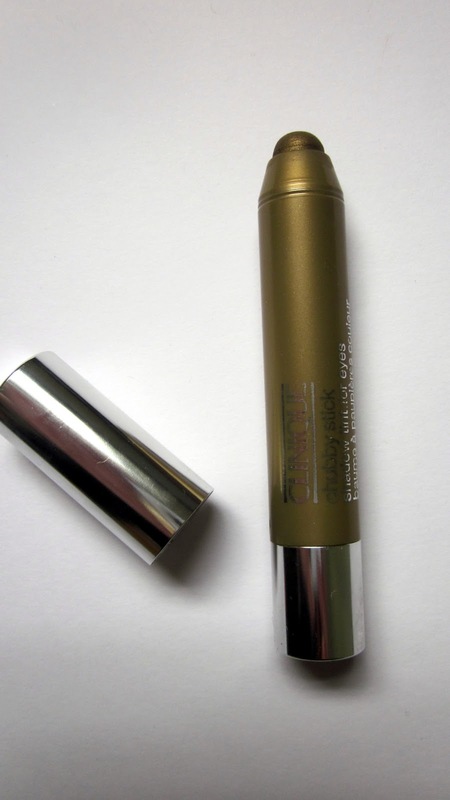 If I was a bit so-so about Clinique's Chubby Stick Lip Colours then I am totally in love with the Chubby Sticks for Eyes. OK so I've only tried one colour but what a colour and what a lovely product. The colour: Whopping Willow - almost green almost taupe almost bronze. Fantastic for day-to-night, quick and easy smokey eyes and bringing out green and blue eye colours. Can be built up in intensity or blended out to be a simple wash. Available in 12 colours from beige to plum via lilac and green. The product: a chunky crayon with rounded/pointed end for incredibly easy application. You twist up from the bottom and can apply directly to the lid and blend with your finger or use a brush. It will last all day. The price: £16 for 3g of colour. Not the cheapest out there but if they have the colour you love this is a lovely product an well worth a little splurge. Also people being a bit bitchy is nothing on have an expensive make-up case stolen which is what happened to one stand on the Sunday. Still completely outraged by that behaviour.